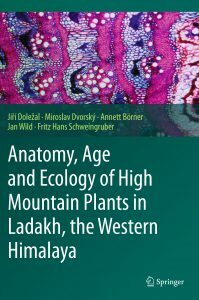 This aesthetically unique book combines ecological, morphological and anatomical, as well as phylogenetic studies on plant material in a largely unexplored dry mountain region above the timberline. It offers the first comparative analysis of hundreds of plants – annuals, perennial herbs and dwarf shrubs – in an area of 87,000 km² at altitudes from 2600 to 6150 m above sea level in the Western Himalaya. Characteristic landscape pictures of all major vegetation types and maps show at which locations and altitudes the individual species of vascular plants are distributed, while macroscopic plant pictures and plant age are related to high-quality micro-sections and micro-photographs. The anatomical features of 345 dicotyledons were characterized using the published coding systems and those of 155 monocotyledones were characterized on the basis of a newly developed key. The number of annual rings and anatomical features of the xylem and phloem of dicots are compared and related to different ecological conditions within this extremely dry and cold environment. The ecological and anatomical characterization is used to create a phylogenetic tree based on nucleotide sequences, and indicates which features are genetically stable and which ones are modified by environmental factors. The book appeals to scientists in the fields of plant taxonomy, morphology, anatomy and ecology.